The Riasco family has been producing Rum in Colombia for over two decades. They're the only family-run Rum distillery in Colombia, and despite their relatively short history, have managed to produce fantastic Rum which has already been recognized World-wide for its smoothness and seductive nature. La Hechicera Fine Aged Rum is their only Rum for the time being. It’s a blend of Rums aged between 12 and 21 years in their special solera system. In 2014 La Hechicera was awarded the Best Bottle Design by World Whisky Awards, but not to be mistaken, while the bottle design is indeed seductive, it’s the Rum inside that has enchanted us. We could drink it All-Niiiight-long. And just so you know, Hechicera means Enchantress in Spanish. Abracadabra, hocus-pocus… now drink! What does La Hechicera Fine Aged Rum taste like? The Flavor Spiral™ shows the most common flavors that you'll taste in La Hechicera Fine Aged Rum and gives you a chance to have a taste of it before actually tasting it. 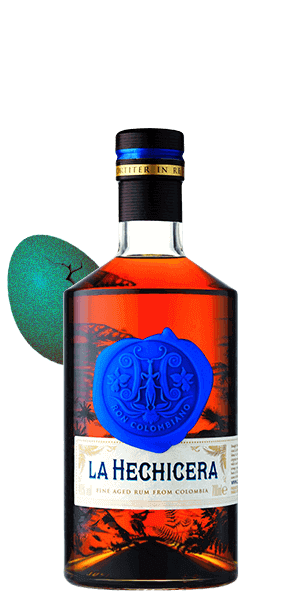 Just a smooth and sweet rum, but of course, is a Colombian Rum just what you expect! Smooooooth, with a nice little spicy aftertaste. Very nice. Smooth. I truly enjoyed the flavors spiral. Quite yummy with almost a hint of cola taste. Not that I'd mix it with coke though. Smooth and very drinkable continuously. Very good. Reminded me of Pusser 15. Perfect for sipping, warm and sweet.